Last summer, we debated around and around about what to do with our exterior finish "look". 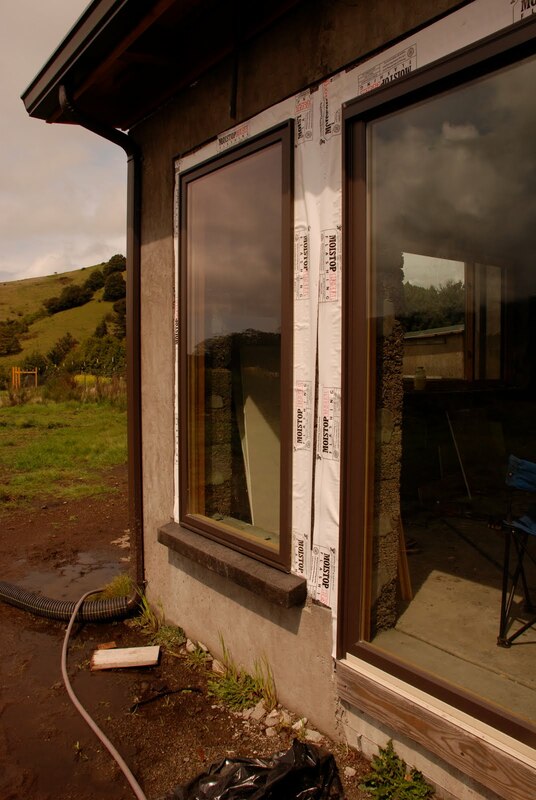 We wanted to install our windows, as designed, with their nailing fin, but we wanted the windows to have a heavier look that defined them more clearly. So, at Karl's urging, we designed concrete windowsills, which we formed out in the fall, and then stained with a concrete stain. They have metal strapping stuck in the back, which slips under the windows, and inside the house for anchoring. Then, the finish coat of stucco will go right up to the edge, blending them into the exterior. Drew and Aaron installed the first ones the other day, because we couldn't proceed with the inside windowsills until the outside ones were done. And we can't plaster until the interior windowsills are done. Lots of "in-order-to's". I'm really happy with how they look. I think they're going to look even more beautiful when the final coat of plaster goes on the outside.